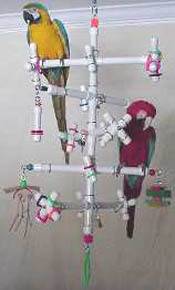 BirdCagePortal.com - Pet Bird Supplies, Parrot Supplies, Cages & Bird Products - KS10-SM - "Kitchen Sink" PlayGym - 10 Perches for SMALL BIRDS (Budgie to Conure sized birds, etc. KS10-SM - "Kitchen Sink" PlayGym - 10 Perches for SMALL BIRDS (Budgie to Conure sized birds, etc. Currently we are showing a photo of the 10-Perch "Kitchen Sink" for large birds. The small size version looks the same except that it is obviously sized for small birds.